It recently occurred to me that I may have stumbled onto a very uncomfortable truth. Could it be that the RIAA/MPAA are fronts for the Green Party here in the US? 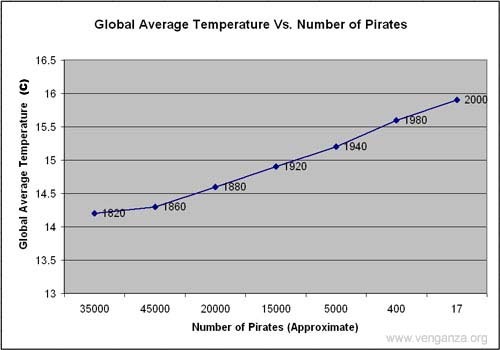 As the number of pirates has decreased, the Earth has seen a steady increase in average global temperature (global warming). This can only be causal, and therefore, the RIAA and MPAA have joined forces, undercover of course, to save the world. The RIAA creates pirates by changing the math behind their sales numbers and the MPAA creates pirates by suing everyone, everywhere. The Green Party has the same motive – albeit through environmental awareness and policy instead of manipulation of the merchantile population’s underbelly. This would be in stark contrast to the recent TechDirt post about the RIAA’s apparent behavior not-unlike the French Button-Makers of the 17th century. I can’t decide what to believe. The first seems so noble, and this one, not. The Boy Scouts seem to be marginally involved as well. So conflicted. 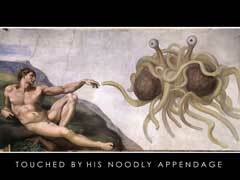 What would the Flying Spaghetti Monster suggest? Perhaps start the Everyone-Gets-A-Vault fund? I’d donate. Posted by Terrell Russell on Sunday, January 21, 2007, at 4:38 pm. Filed under flyingspaghettimonster, fsm, green party, mpaa, piracy, pirates, riaa. Follow any responses to this post with its comments RSS feed. Both comments and trackbacks are currently closed.